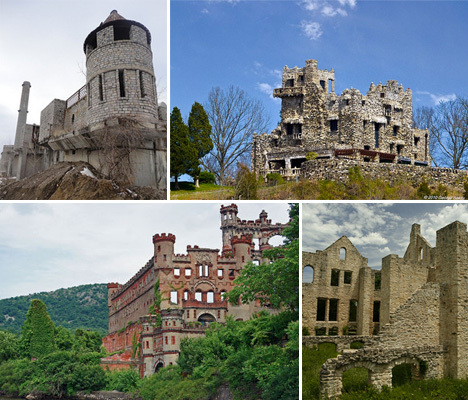 The word ‘castle’ may conjure up visions of medieval villages in places like Scotland or Romania, but believe it or not, America has its own incredible ruins of vast stone estates. They’re just not nearly as old. 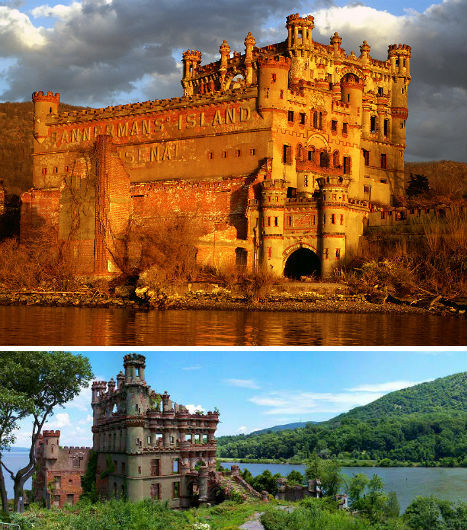 From an abandoned cement plant turned amusement park to luxurious private estates that are now claimed as state parks, here are 7 of the nation’s greatest castle-like abandonments and monuments. A crumbling abandoned cement factory in St. Louis had become a dumping site for construction waste when local sculptor Bob Cassilly first saw it. Among all of the trash, debris and rusted metal, Cassilly envisioned the beginnings of a reclamation project that would not only clean up the site, but transform it into something positively regal. So he got a bulldozer and began the process of cleaning it up himself. 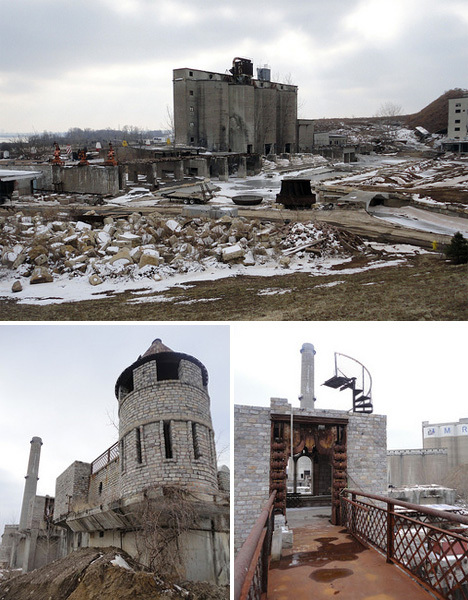 All of the junk that was formerly piled around the property became the turrets, gates and bridges of a modern-day industrial castle. People began to notice, wondering what it might turn into. While Cassilly had every intention of turning the site into an amusement park, it wasn’t to be. Cassilly tragically died in an accident with his bulldozer onsite, and the park remains unfinished, becoming somewhat of a memorial to the man who saw so much promise in what other people considered an eyesore. 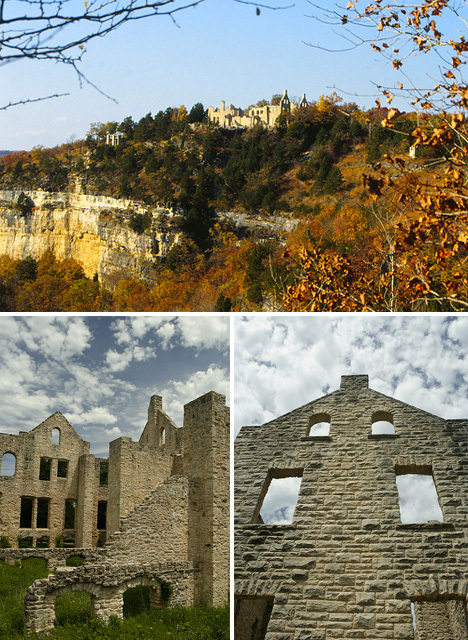 Also in Missouri, on a bluff overlooking Ha Ha Tonka State Park, this ‘castle’ is really just the ruins of a wealthy man’s failed dream. Kansas City businessman Robert Snyder bought 5,000 acres of land in 1905 and began construction on a lavish mansion complete with water fountains and grand arches hand-wrought by stone masons flown in from Europe. Snyder died just a year later, in one of the state’s first automobile accidents, but his sons kept the construction going, and one lived there for decades until the family’s money ran out. The property became a hotel and lodge. In 1942, the whole building was destroyed by a fire. 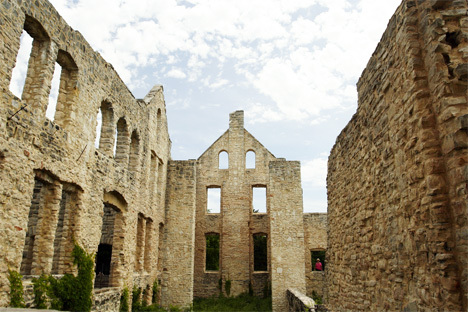 When the state purchased the property to make it part of the park, they preserved the stone ruins as a unique historical monument. Looking at photos of this striking castle facade, you might imagine that it’s located somewhere in Europe. Surprisingly enough, it’s actually within minutes of Manhattan. 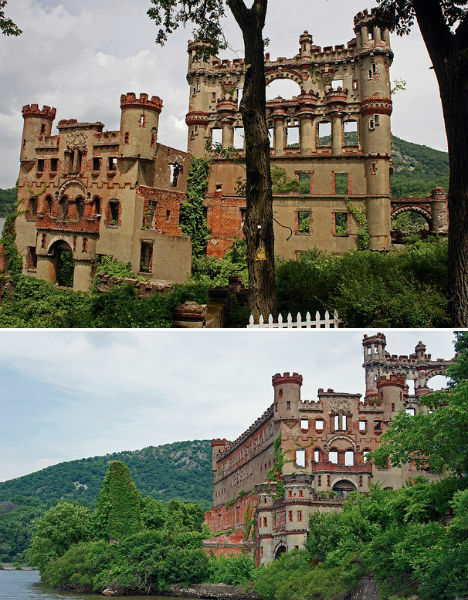 Bannerman Castle was built on an island in the Hudson River that had previously been used as a military prison by General George Washington during the Revolutionary War. Businessman Frank Bannerman purchased it in 1900 and spent 17 years building his Scottish-style dream castle, which he used to house his enormous collection of surplus military equipment. The castle features docks, turrets, garden walls and moats, but for all its ornamentation, it was little more than a warehouse for decades. After Bannerman’s death, the estate was sold to New York State, the military goods given to the Smithsonian. However, a raging fire of indeterminate cause destroyed most of the buildings and the belongings that were left inside in 1969. All that’s left are these skeletal remains, which are now preserved by a historic foundation. 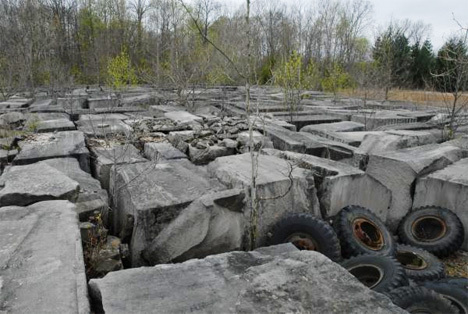 Anyone who came upon this bizarre stone structure in the middle of the woods in rural Indiana might think they had stumbled upon ancient ruins. 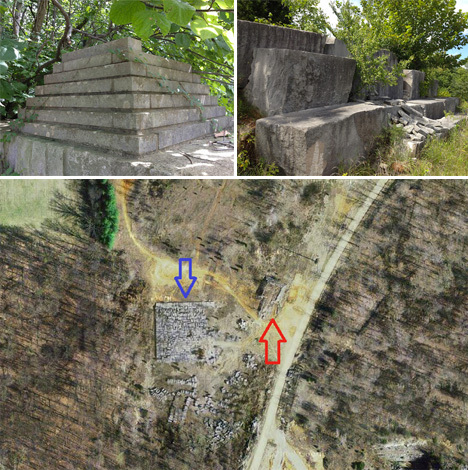 A series of partially-built pyramids can be found all over the property, as well as the remains of a large stone wall. But the origin of these structures are a little more mundane than the deteriorating history of a forgotten civilization. The pile of stones is all that’s left of a $7 million effort to build a limestone ‘amusement park’ that aimed to call attention to the ‘Limestone Capital of America.’ The town of Bedford wanted to compete with larger, more well-known cities for tourists and imagined that building a 1/5 scale replica of Egypt’s Great Pyramid, as well as their own miniature Wall of China, would do the trick. Bedford is, indeed, where much of the nation’s limestone is sourced, including that used to build the Empire State Building. But many locals felt that the project was wasteful, and soon, the funds to build it – in the middle of an open-pit mine in the neighboring town of Needmore – were depleted. The site has been abandoned for about three decades.